Latest post Sun, Jun 24 2018 9:50 AM by Corne Scheepers. 5 replies. I purchased BCC Key and Blend in order to have blending modes available inside of Media Composer for a big project. Under BCC RGB Blend I see all the belending modes there, only I'm not getting the same instant results I did with eg. Add mode in After Effects, so either I'm doing it wrong or BCC requires a lot more tweaking to get the same results. I have a clip of a light leak that I want to apply Add mode to so I can overlay it with a regular video clip. 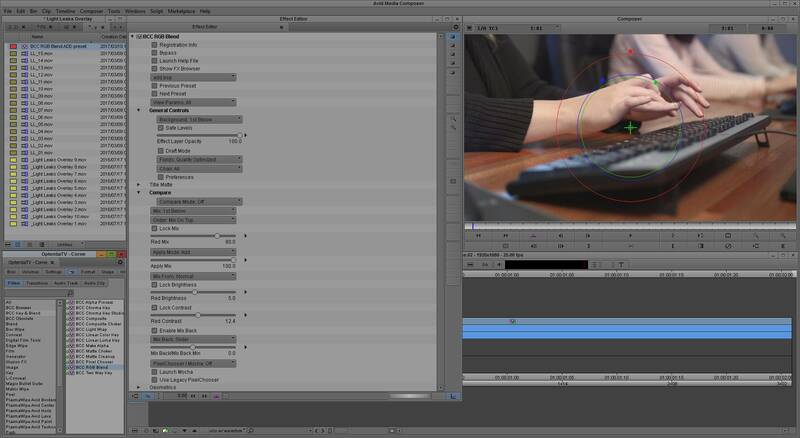 In After Effects the black portions key out perfectly when I select Add mode. With BCC RGB Blend in MC I get a key but it's not a clean one yet...it's as though the brightness and contrast still needs work. Where am I going wrong? Does anyone have a set of settings they would be willing to share? You need to be more clear about what you mean. For example, if the master clip is on V1, and the light leak clip is on V2 and you've applied the BCC RGB Blend to V2, then the entire image is likely to go dim where ever the lieght leak clip is black if you're using all the default parameters. If this is the case, change the Order parameter from Order: Mix on top to Order: Original on top and see if that fixes the issue. Otherwise, it would be helpful to have some screenshots of what you are getting and what the parameters are being used on the effect. Changing the order parameter did now help me to get started in setting up a preset BCC effect that I can continue with, thanks. 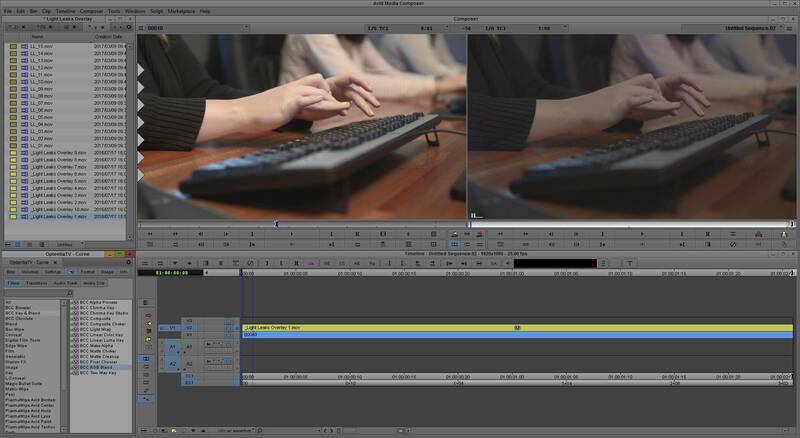 Example: V1 is my video track (hands and keyboard, shown here in Source Monitor), V2 the light leak shot (Record Monitor). When I apply BCC RGB Blend and select the add.bsp preset, I did initially get a key, but V1's brightness was way down, in spite of V2 starting in black and only then moving into the light leak that I want to use as a transition. So I then grouped the Lock Mix sliders and adjusted brightness and contrast until I got the start frame of both the original source clip and the final effect clip in the sequence at the same brightness. The rest of the effect now looks right and I can use the light leak as a transition as I planned. Is this the way BCC works? You just need to tweak things manually? For what it's worth, tried BCC key & blend to get transfer mode. Unlike you I used BCC Composite. Perhaps you were going for something different. I was doing screen blending. To get a clean blend for video level foreground (black 16/16/16) on video level background i had to tweak the BCC Composite effect a little. By default using Screen it seems to interpret the V2 segment as full levels or something like that. I adjusted "Levels/Gamma" input black, output black and output white. This gave me something almost perfectly blended. Might have to adjust a little when tring different material. Thanks for pointing me at BCC Composite! Just tried it, played around with the settings and it works perfectly!